Clover Cottage is located in the southeast of the Peak District in the beautiful, historic lead mining village of Winster, near Matlock, Derbyshire. The village has a long and rich history, and a thriving community. Click here to see a map of where Winster is located. 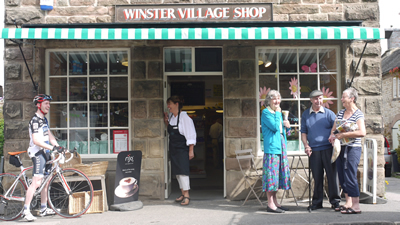 Some visit Winster due to its history and typical Derbyshire architecture, while others stay here as a base from which to explore other local attractions – of which there are many. The village has several websites and we’re active on social media. You may be interested in the Village Website, Winster Facebook page*, our annual jamboree Winster Wakes*, or the annual Secret Gardens of Winster (I created those marked with an “*”). I’ve also created a handful of videos in recent years – a few are below. More videos will be posted as and when I make them. Click on the map and drag it around for a virtual tour of our village.